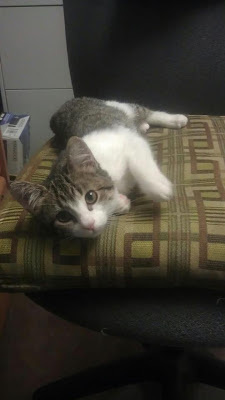 Penelope is a kitten (between three and four months old) that was first found in a shelter, then was moved to Petsmart, and then moved to a foster home because they thought she was sick... And it turns out she wasn't sick, she was just acting shy. I found out about her through a friend Rachel, who fosters kittens from shelters-- and it turns out her mom does too. Penelope's foster mom was Rachel's mom, and we went to meet her Saturday morning before I had to go to work. Casey and I brought my friend Andrea (who was here from out of town) and our roommate Peter to throw in their opinions. Long story short, we all fell in love with her and took her home immediately. She wasn't as shy as we thought she'd be. And since she's been home she is active, loving and sweet. We're doing the long introduction to Stella, our other cat, who we're not sure will like sharing our attention. But we think she might, in the long run, enjoy having a buddy at home when we're at work. So here we go! We're now two for two: Two cats and two birds. What should we get next? I am honored, humbled and pleased to announce that I've been cast as Ballet Ariel's Sugar Plum Fairy for our 2012 Nutcracker. Our shows are in Denver the second two weekends of December, so if you are here, I'd love to have you there! Sugar Plum Fairy is an interesting role. She is widely known by her famous music (which you will soon be hearing tink-tinking out of the speakers Macy's, JC Penney's, and any mall in general) and as being the princess/queen role in the Land of the Sweets. She is the one to greet and reward Clara for saving the Nutcracker Prince's life, and she has the honor of dancing at the very end of Act 2 of the ballet with the Cavalier. Seriously though-- a lot of little girls in ballet (including myself as a little dancing tyke) look up to the Sugar Plum Fairy. That is something I am super aware of. The expectations placed on the Sugar Plum are fairly high, and in the ballet world the expectations are even higher among professionals. It is a role that involves a lot of serious and difficult ballet technique. This is why I feel so honored to be chosen to do this role again (I also danced this role last year with Ballet Ariel). As a girl who loves ballet technique just as much as a silly, high energy musical theater number, my heart feels full at the thought of being able to perform this role again. I am honored also to be paired with my often-partner and dear friend Peter, which is super fabulous because I believe we work really well together. However I'd be lying if I didn't say I have some butterflies in my stomach thinking about taking on this huge role once again. I've been given a huge gift and I mean to make the most of it. The butterflies will keep me on my toes (literally) and super aware of the responsibility I've been given. I can't wait to start. Sometimes miracles happen. Big ones, small ones, "insignificant" ones that slip by unnoticed if you don't pay attention to what is happening around you. They pull the dingy gray curtain back from your ordinary day and remind you that there is a beauty beyond what we see. Every time I step onstage I expect the unexpected. Years of performing have taught me to do this, and I am never disappointed. I was privileged to perform again with Ballet Ariel (pictured above in Greg Gonzales' contemporary piece "figs of my im.") in "Fire Dances," a mixed rep on October 13th at the PACE Center in Parker, Colorado. Saturday brought to us two performances in one day, which would not normally have phased me-- however, this show brought more strenuous dancing than ever before. I am pleased to report that I got through the two shows fine, with even enough energy to go out afterwards to eat and relax with the company and friends. In my mind, the biggest miracles I experienced on Saturday weren't necessarily making it through tech week and the two shows punctuating it. They were the amazing moments I experienced onstage despite being tired. My favorite part of performing, as many of you know (and I have blogged about before), is creating a character for the steps I do in rehearsal and onstage. This gives me a way to "flavor" the choreography and tell a story instead of just doing technique for the sake of technique. I don't find anything wrong with simple technique (that's the beauty of Balanchine! ), but this is how I am built: When I have a reason for doing a leap or turn, I find that my performance quality goes up tenfold and I have so much more motivation to push through the physicality. Some miraculous moments for myself and my characters in rehearsal and performance: Allowing the music of "La Bayadere" to transport me to India and transform me into Nikiya the temple dancer, a woman with a burning secret she cannot tell anyone... Playing with facial expressions and interactions as "The Flirt" with Charlie Chaplin in Ilena Norton's "The Chase," and being part of creating bits of comedy that made the audience laugh... Channeling my inner alien supermodel and attempting to control the mind of a man in a chair ("figs of my im. "), this motivation becoming second nature onstage (as if it were totally normal like shifting gears in the car, or making the bed)... Almost feeling the boiling lava pour out of my fingers as Pele the volcano goddess-- the passion, anger, and self-absorbed nature of this goddess taking over as I pushed my way through the final part of the show... The countless interactions between performers as we tell a story together and inexplicably become one in the process. The biggest miracles sometimes last only a couple minutes, or even just a fraction of a second. I am so grateful God has opened my eyes to these gifts and allows me to share them with others. These moments are so precious and I have learned to protect them fiercely against self doubt, fear, and circumstances beyond my control. 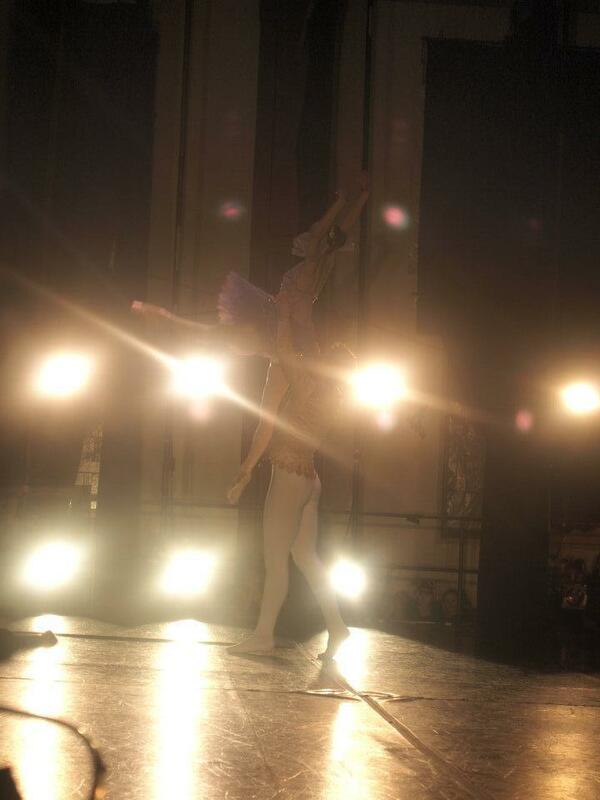 I am looking forward to more miraculous moments in the next couple months through the Nutcracker process!